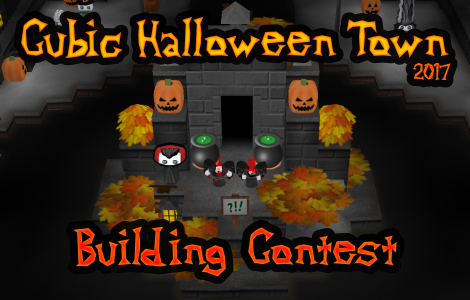 Cubic Halloween Town  - Results! Special design prize, a very creepy and artistic clown head! Special comedy prize, who knew this item combo can make such a great house?! Special block-usage prize, the grass hair and flame-y leaf eyes say it all! The leaves are falling and the wolves are howling... it's time for Halloween! Your task is to build the creepiest candy-distributing house in town... you don't want these pesky kids to egg your house now, do you. Each 9x9 spot is equipped with an anti-spirit fence to keep what's lurking in the shadows at bay. Each spot costs 5,000 cubits to rent, but worry not, it will be returned! As for the amount of spots... they're not limited. 2 whole new sections await if you follow the main road sideways. If you'll need more, we'll add more! Your houses will be judged on three factors; creepiness, house design, and of course how good your front yard is! It's all about trick'o'treating. Be nice to your neighbours and townees, the town spirit likes to take matters into its own hands on Halloween. Only one build per person, if we find anyone using alts to rent more than one spot they'll be automatically disqualified... and the abyss calls again. After the event ends, you will have one week to collect your stuff from the rental. After that, rentals will be wiped. Remember to leave your username on the porch so we can distribute the prizes! Results will be announced a week later. The towns are now unlocked! Cubits were returned in complimentary piggies.